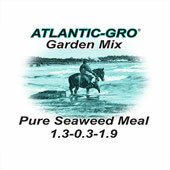 This dried seaweed meal is composed of Kelp, Rockweed, Furcellaria and Irish Moss. It does not contain artificial additives, preservatives, fertilizers, pesticides, hormones, antibodies or genetically modified organisms (GMO). It is suitable for any garden plants.